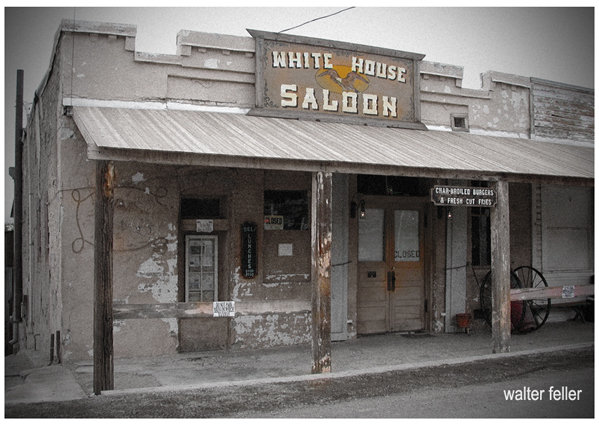 I called in all my Ghost-Writers here at Old Fort Oliver to help on this Ghost Town edition. Old Jake Topper told about the noisy Ghosts he saw and heard up at Randsburg. Says he saw two skeletons dancing on the tin roof of the old Hubbard Printing Shop. Determined to get a better look, he climbed a ladder to the roof of the White House Saloon next door, as he stepped off the ladder toward them the two skeletons stopped dancing and reached for their shrouds. Jake said it was sure eerie. Right then and there — said Jake — I made up my mind never to worry again. So saying goodby and keeping worry out of my mind I started down off the roof, and by gosh, you know I fell down the last three steps of the ladder and broke my ankle.